What touches my heart? All the usual things Grandkids, family, flowers, butterflies, kittens and the great outdoors, etc. But what has touched my heart in a special way is what I am going to talk about. 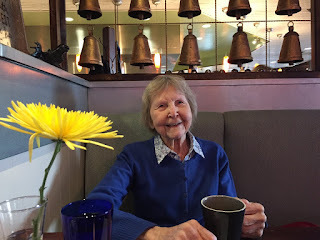 As some of you know Sarah and my mom was admitted to a memory care facility, Mill View memory care, in October 2018. While Mom was there for the two months before her passing I witnessed countless acts of kindness that truly touched my heart. The volunteer from Partners In Care helped our 92 yrs. old mother to shower twice a week. Madeline was so sweet and she would blow dry mom’s hair and always do a little something extra. Sometimes she would braid mom’s hair and sometimes she would put a flower or hair barrette in her hair. The point being, she went the extra distance and made mom feel special. And made me feel good. Mom liked Madeline, but always called her Katie after her granddaughter, who is also blonde and tall. Madeline told me she would answer to any name mom called her as she thought mom was a sweet lady. The nurse who did the pedicures and toe nail polish for the patients, told mom and me that mom had beautiful feet. It warmed my heart to see the smile that compliment put on mom’s face. Even between the patients there were touching moments. One lady who no longer new her name would sit down and play the organ. The patients would call out tunes and she’d play them. Once a patient got up and did a little dance and encouraged others to follow suit. Mom didn’t want to dance and the patient came over and took mom’s hands and clapped them together. Mom smiled and clapped in time to the music. This tender moment touched my heart. In her last days mom’s mind was in the past and I became Hazel to her. Hazel was apparently a friend from mom’s childhood. She didn’t want comfort from me. Mom was so agitated and angry at “Hazel” (ME) for not working the code and opening the door so mom could go home. The Director of Mill View took mom’s hands and walked backward with mom's hands on her shoulders for support. Up and down the hall so mom didn’t need her walker. She talked to mom in a soothing voice and walked and walked with mom. Up and down the hallway I don't even know how many times. I heard mom say “You are a very nice person!” I was a little jealous for a split second because in mom's mind I was 'Hazel', and then I was so grateful that mom could relate to the director and was comfortable with her and no longer agitated. I am touched and thankful for all the good moments mom had those last two months. I saw her almost every day. It was heart breaking to have to put her in 24-hour care. She lived a good life and even the last two months had some very special, heart touching moments. Cherish and treasure your love ones. Say now all the things you want them to know. Because once they are gone, you can't!! Mom was a terrific scrabble player and she was a sweet lady. She passed on December 5th, 2018. That must have been so hard but it's wonderful that you saw the beautiful souls helping your mum and were gratefully appreciative of their kindnesses. Very touching. A loving tribute to your mom. I know where the first picture was taken and I may have even been the one to take it. Sure do miss meeting up there and seeing the hummingbirds! Love the vignette about the director walking with your mom, helping her "go home" in some ways because she was up and moving. Very special moment. My condolences, Diana. Kind souls can make all the difference in a difficult situation, especially when taking care of our elders. Thank you for your kind comments, Dora. Yes, you did take that picture , Judith! I miss our meetings at Marion Forks, too. I think you're right about the director walking with mom and helping her to go 'home/. Mom went in a coma that night and didn't wake up again. Thank you, Lynn. I must say everyone I met at Mill View and from Hospice were very kind souls. Our family was lucky to have them looking after Mom. I liked your mom and she was very lucky to have such a caring daughter. 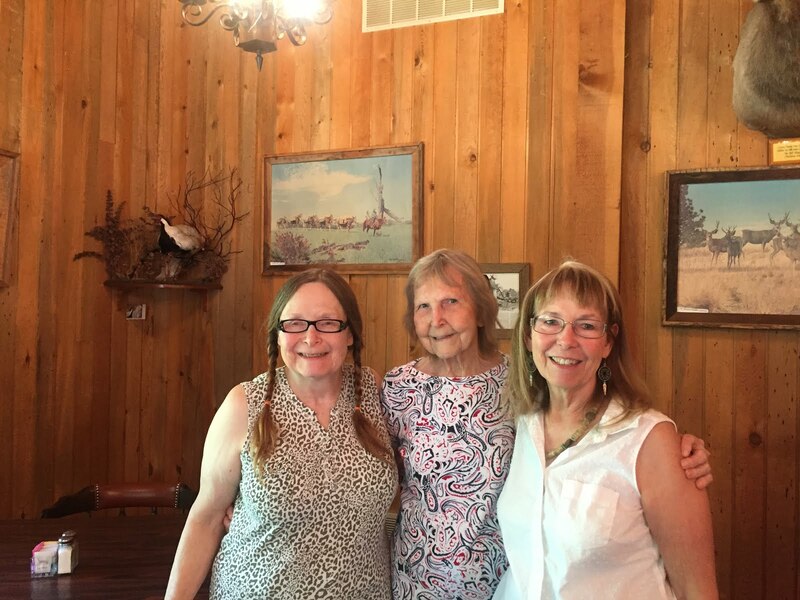 This blog warmed my heart, Diana, You have special times to remember with your mom. Cherish them always. So glad you had wonderful people surrounding your mother. Thinking of you. Your love for your Mom shines thru in your blog. I am glad I got to met her. It is wonderful to have happy loving memories of her. Take care. Thanks Kathy! Mom really liked you and Nick. She always asked after you when I came home from having coffee with you. Thank you Deb. We were lucky to have a good caring staff. Thank you Louise. Mom heard me talk about you so much, she was happy to finally meet you when you came through on your vacation. Thank you for sharing these touching memories of your mother's final months in a care facility. It is one of the most difficult things to do, to put a parent in a facility after you've been caring for her so long. But it was the right thing to do because they had the ability to make sure she was safe. It sounds like there were many wonderful caregivers there. She was very fortunate. I'm so happy you shared a picture. I can now see yours and Sarah's resemblance, particularly in the smile. She sounds like an amazing, wonderful woman. One day at a time and the pain will become more and more bearable. It never goes away, but you learn to live with it and accept it as months and then years pass. The more you share your memories, the more alive she becomes in your hearts and those of others. Now each of us reading this blog can hold these memories of love and care and touching your heart within us as well. Thank you for writing this beautiful post, Sister. You captured the good memories of that difficult time eloquently. Your post lifted my spirits! That was sweet and beautiful, Diana. Our moms and their caregivers deserve praise and recognition. You were always a loving daughter.